Shaken with two olives: Galileo 21 features a matte olive acetate frame. Grey lenses (choose between standard or polarized) and camo granite side inlays complete the look. And yet it moves: Galileo once said that "All truths are easy to understand once they are discovered; the point is to discover them." We did just that with the design of this frame. Our oversized Galileo frame shape is classic and sophisticated and uses only the finest materials and best craftsmanship. Each frame is meticulously handmade in Japan and features high-quality shatterproof lenses with 100% UV protection. The Galileo shape was designed to be comfortable and flattering on all face shapes. Its super-durable construction and smooth, high-quality hinges ensure these will be your favorite shades for years to come. Design the Galileo to fit your style! 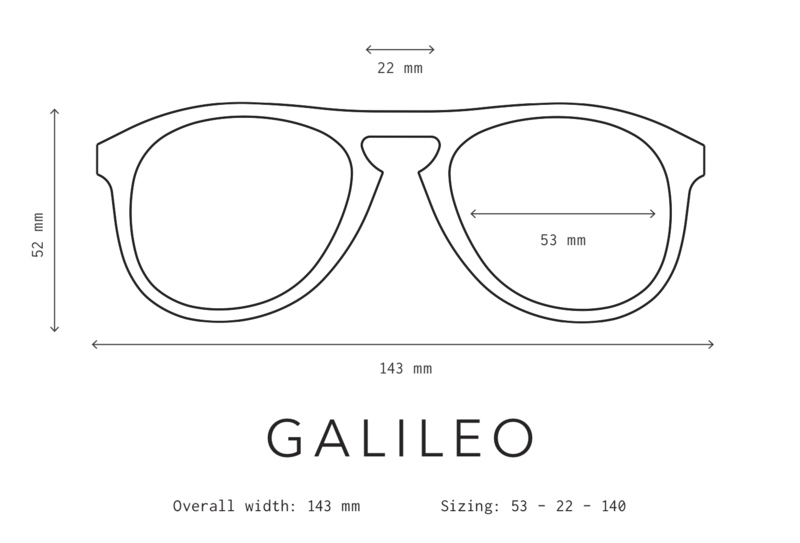 Galileo was the most futuristic visionary of his time, and inspired these eponymous frames. He was the father of modern astronomy and his improvements to the telescope led to consequential astronomical observations, including the heliocentric nature of our solar system. While our Galileo frames aren't telescopic, you can at least see the world through rose-colored glasses (or steel blue, neon yellow, and bronze, just to name a few). And with a heliocentric future so bright...you gotta wear shades.